When Lindsay and Major Colin Culkin met, fell in love and got married, the two mutually decided to pursue adoption to grow their family. The couple — who now live in Carlsbad, California, after spending two years overseas for Major Culkin’s military deployment — received paperwork for two twin girls and instantly knew that they had been called to bring the sisters into their family. The Culkins officially brought the girls home last summer, fulfilling their adoption dream, but they have still been paying off the associated expenses months after the adoption was finalized. For those who don’t know, adoption can be an expensive process, sometimes exceeding $30,000 — or more. And in this case, the Culkins brought two children into their home, a more costly endeavor than they had initially imagined. “We really had not done the financial planning for adopting two children and then we saw these two girls and our hearts just went out to them,” Major Culkin recently told “Indivisible” and “Grey’s Anatomy” star Sarah Drew during a sit-down interview about the adoption. The Culkins turned to Adopt Together, a crowdfunding platform that helps families raise resources to complete the adoption process. And now PureFlix.com is also part of the Culkin family’s journey. Thanks to YOU — the PureFlix.com family — the Culkins’ remaining adoption expenses have been covered in full. The couple shared the details of their incredible journey with Drew, as Lindsay Culkin revealed why she felt so drawn to adopt in the first place. After the two discussed plans to start a family, they decided to adopt first and perhaps have biological kids later on. Major Culkin, a U.S. Marine, was recently stationed in China for two years, which is when he and Lindsay decided to start the process. 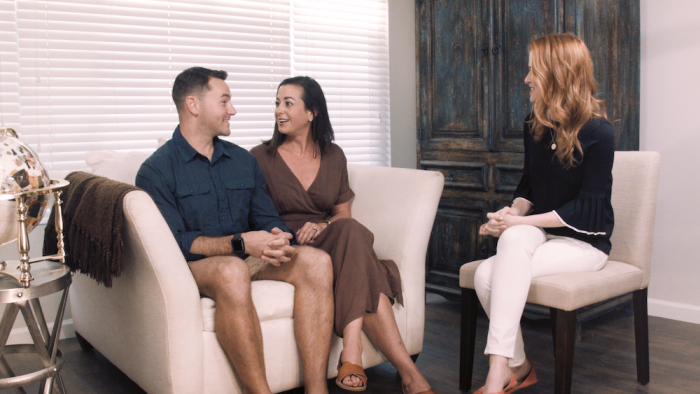 Lindsay and Major Culkin were emotional and overjoyed when Drew told them that the PureFlix.com community would be covering the remaining costs of their adoption. The couple has repeatedly expressed gratitude throughout their journey. Adoption is a long, costly journey that few couples can do alone. The Culkin family chose Adopt Together as the perfect place to start their journey. Donations are tax-deductible and can only be applied towards verified adoption expenses, making it a safe way to give charitably and be assured you’re making a real difference. You can look for other awesome families to support at AdoptTogether.org. Learn more about the other ways your PureFlix.com membership helps us give back here.